In 2014, the full century was celebrated since the construction works at the Neptun (Baths) Palace were finalized. This is one of the most emblematic buildings of Timişoara, known for its large bath facility and swimming pool, both of which existed, not long ago, right here. Today, the edifice hosts office spaces for companies, a restaurant and around 20 apartments in the “Neptun Apartments Block”. 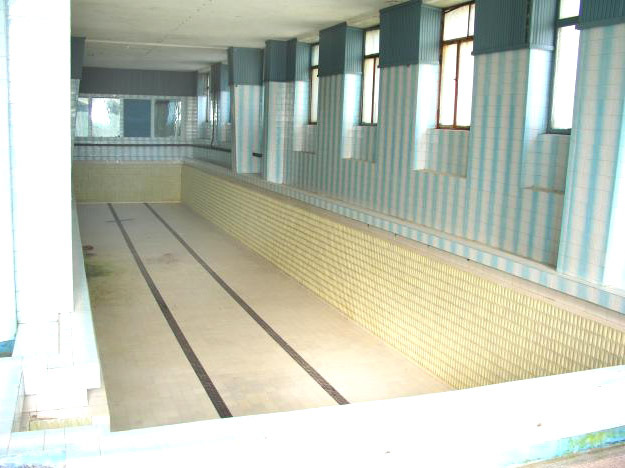 A few sealed conducts, that used to supply the public baths of old times and also a few pools, abandoned in the semi-basement of the building, are the only proofs of the function which the Neptun (Baths) Palace had in the past. On 30th of March 1912, the chief-architect of that time in Timişoara, László Székely, receives authorisation to build the Neptun Palace, a project which he finished in 1914. Initially, the building was supposed to be the location for an elegant coffee shop but this idea was rejected. 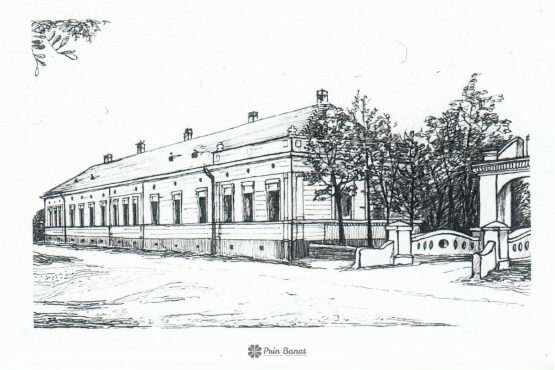 At the time of its inauguration, the Neptun (Baths) Palace had a modern ensemble of public baths, a swimming pool and a restaurant, all of which, functioned for a long time in the city of Timişoara. The public baths, especially, were designed to replace the old Turkish baths in the Fabric neighborhood and were open during a period during which not many locals from Timişoara could brag with owning a private bath at home. The imposing structure is an example of the Viennese Secession and bears on the front the initials of its architect: “L. S.”. At the same time, the roof canopy is a replica of the esthetic of Otto Wagner. During the Austro-Hungarian Empire, the Neptun Palace was known under both the names of Hungária Fürdö (Hungarian Baths) and Székely House – named after the architect László Székely, who was the first owner of the building. After 1919 the building receives the name kept until today – Neptun (Baths) Palace, with a few exceptions, when the edifice is referred to as “Cantral Bath” or “Popular Baths”. 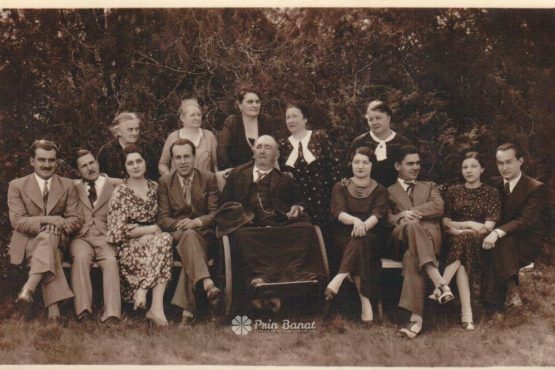 In the 1930s, the Nobel family was the owner of the nationalized palace.1)Getta Neumann – Destine evreieşti la Timişoara – Portretul comunităţii evreieşti din perioada interbelică până azi, Hasefer, 2014 At the same time with the installment of the communist regime, the Neptun (Baths) Palace was nationalized, belonging to the GIGCL (The Enterprise Group of Local Administration and Living) Timiş county, Sanitation section. Today, the main facade of the Neptun Palace hosts office spaces and a luxury restaurant. Also here, through a separate door, on the left side of the Neptun Palace is the entrance to the so called Neptun Block of Flats. This name was strengthened, especially during the communist period, when the public baths from the semi-basement (including the swimming pool at the first floor) and the Neptun apartment block were administered separately. At the entrance of the Neptun apartment block there was a doorman hired by the GIGCL, who used to greet the locals that came to the baths. Also, for several years, inside the room from the semi-basement there was a functional laundry. 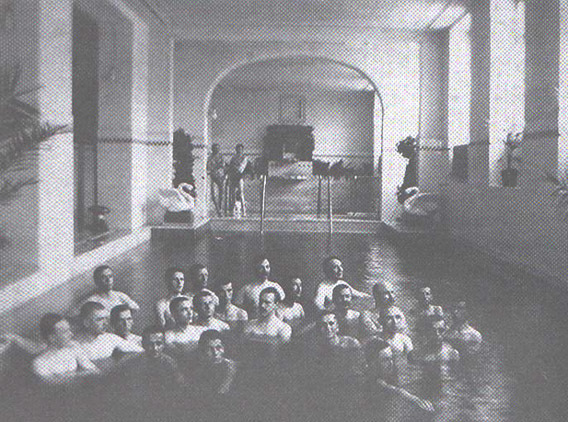 In the old times, the polo team from Timişoara, ILSA (the Wool Industry, Anonymous Society), used to practice in the small pool of the Neptun Palace. 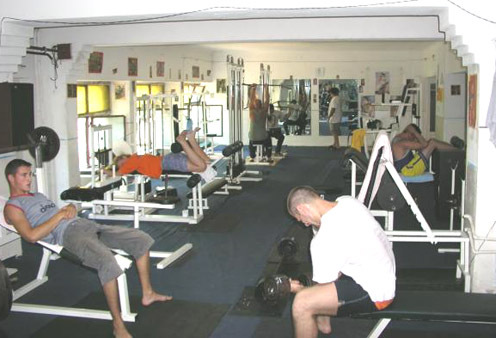 In 2003, on top of the famous pool, a fitness gym was built, that functioned until approximately 4 years ago. After that, the building was bought by a well known company from banat that bottles water and that’s when the building underwent a major renovation process. The swimming pool is no longer highlighted this time, a restaurant being built inside this room, but the Neptun Palace regains its glow, the restoration process following to a certain degree the original interior design. A year ago, the restaurant space was lent to the Duo Group commercial society, which opened the Merlot Restaurant here. We overtook the restaurant space in the month of October, 2013. The main alterations to the building’s architecture were made by the actual owner of the building. We have interfered only when it came to the ambiance details: we have warmed the atmosphere with art objects – paintings, statues, mirrors, flowers, etc. From a culinary perspective, the restaurants are not divided depending on the historic periods, but rather the geographic regions. Merlot has a mediterranean fusion, which, along with the attentive service and elegant atmosphere, result in a unique mix. The historic period in which the building was built makes a mark on the pleasant and elegant ambiance of the restaurant. It accentuates it, it validates it, if you wish, told us Radu Ianas, the general director of the restaurant. Before, there were no conditions, there was no hot water, like now. Mrs Gheregi, our guide inside the Neptun Apartment Block, has lived here, along with her husband, for approximately 15 years. She isn’t able to give us too many details regarding the building’s past, but she’s glad to guide us through the winding corridors, like those of a labyrinth, starting with the basement, which used to shelter the public baths and the laundry. The location of the former public baths was turned into storage lockers for those who live inside the Neptun Apartment Block. Even the water pipes that once used to supply the baths are not functioning anymore, having been sealed and closed. There were also pools here. I don’t know what happened to them, because work was done. We don’t know, we’ve been here for only 15 years. My husband, as a boy, used to come here to the baths, because the water was warm. Around ‘73 I got hired in Timişoara and I heard that my colleagues used to come here also. Before, there were no conditions, there was no hot water, like now, told us Mrs Cheregi. You see how resistant were the buildings buit 100 years ago? 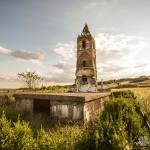 I understood that the block was built by the Austro-Hungarians – that’s what I got from the elders that lived here. Upstairs, there are plaques written in Hungarian, Mrs Cheregi also told us. It’s true that there are plaques which indicate every level on the Neptun Apartment Block and that have been kept intact to this day, being written in Hungarian. From a previous discussion with Mrs Cheregi’s husband, we also found out that the public baths even had a children’s pool, but it was broken. The same faith was shared by the tubs in the semi-basement, which were destroyed and sold for metal scraps. The old elevator from the Neptun block functioned almost until ‘89, after which all its pieces were stolen and taken to another elevator from a building of Timisoara. “In the city there are another two elevators identical to this one: one is in the Materna building, but I don’t know if it still exists, and the other one is in the building across the street of the Continental Hotel. Mister Cheregi added that the people in the Neptun Block plan to dismantle the old elevator and sell it to meal scraps. We hope that, eventually, this thing won’t happen. The Neptun (Baths) Palace is located at the entrance of the historical Fabric neighbourhood (see map), on the intersection between the Splaiul Nistrului – before the Galaţi Street and Boulevard 3rd of August 1919 – before Liget Ut, then, the 12th April 1961 street, and is part of the Urban “Fabric” Ensemble (II). In the vicinity of the edifice there are two more remarkable constructions: the oldest reinforced concrete bridge and the oldest park in Timişoara. 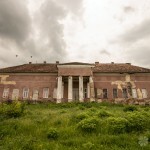 1 comment at "The Neptun (Baths) Palace from Timişoara"